"The 'democratisation' of the functioning of the Union is of paramount importance," said MP Spyros Danellis. The latest period of Greek politics was marked by the final step of the decades-long Macedonian name question which was the 2018 Prespa Agreement. During the period that intervened between July 2018 and January 2019 (when the Agreement was ratified by the Greek parliament), Greek society was deeply divided and polarised. Greece’s government, however, considered it a major achievement in foreign policy. It was viewed as a solution of the problem, on the one hand, and a breakthrough for opponents who rejected any mention of the word ‘Macedonian’ in the constitutional name of the Former Yugoslav Republic of Macedonia (FYROM). The debate and the entire process left deep wounds on Greece’s smaller political parties since the polarisation risked creating a political deadlock. Some deputies of the opposition preferred to support the agreement. The swing vote by Spyros Danellis secured a positive exit to a deadlock by securing the necessary majority for the government. Danellis was an MP for the leftist Synaspismos party between 1996 and 2000. He served as mayor of Hersonisos (Crete) between 2003 and 2009 and was a member of the European Parliament between October 2009 and June 2014 for Pasok. Since January 2015, he was a member of the parliament for the party Potami (The River) whose MEPs participate in the S&D Group of the European Parliament. During the final vote he became independent. Since the Macedonian name issue emerged in early 90s, Danellis has supported the idea of a solution acceptable by the two sides. It is obvious that his latest decisions reflect views he has expressed for decades. European Interest: The Prespa Agreement has led to intense political debate in Greece. You have been removed from your party because you decided to vote for its ratification by the Greek Parliament. Why do you think the Agreement is so important and should be ratified now? Spyros Danellis: Let’s take things in turn. The prime minister asked for a vote of confidence, responding to the challenges of those who argued that with the withdrawal of ANEL [the Independent Greeks party, a coalition partner] from the government due to the Agreement, the government missed the confidence of the parliament. In addition, let’s clarify something else. From my party, Potami, they have cut me off without considering that the Agreement would never come to pass if I did not vote in confidence in the government. In other words, my vote has ensured that the Prespa Agreement will come for ratification in the House. With this agreement, we not only did not sell Macedonia, but instead abolish the monopoly of neighbours, since so far all of them have been recognised it as just “Macedonia”. In any case, the Prespa Agreement meets our major demand, a compound name for all uses. The Agreement was embraced by the supranational organisations (EU and Nato) to which we traditionally belong. This is why the stabilisation of the Western Balkans is a strategic choice. Addressing the growing Russian influence in the Western Balkans, as well as Turkish Islamic penetration, is achieved by joining Nato and prospectively in the EU. The issue came out of the refrigerator when FYROM’s nationalist intransigence ceased. That is, after the emergence of the government of the Social Democrat Zoran Zaev in coalition with the Albanian parties, with the nationalist VMRO in opposition and the hard-core Nikola Gruevski crumpled by scandals of corruption and mismanagement. During the debate on the Prespa Agreement, two traditional parties, New Democracy, the main opposition party and member of the European People’s Party, and Pasok (KINAL), a member of the Socialist Group in the European Parliament, opposed the Agreement and found themselves in disagreement with their sister European parties. How do you explain their stance? It is not accidental the coldness of the New Democracy and Pasok sister parties in Europe, i.e. the EPP and the Euro-Socialists, who do not understand the temporary, micro-party feats that prevail in our country. This is because, while the Radical Left perceives, adopts and works towards the upgrading of the country’s geostrategic role, in full consistency with our European partners, the systemic opposition (ND & Pasok) is moving away from its historical stances. Of course, this is understandable. Mr. Kyriakos Mitsotakis chose to adopt nationalist rhetoric in order to rally the forces of his party, ignoring the apparent contradiction, but also how to handle the extremely divergent views that will be fatally manifested tomorrow. 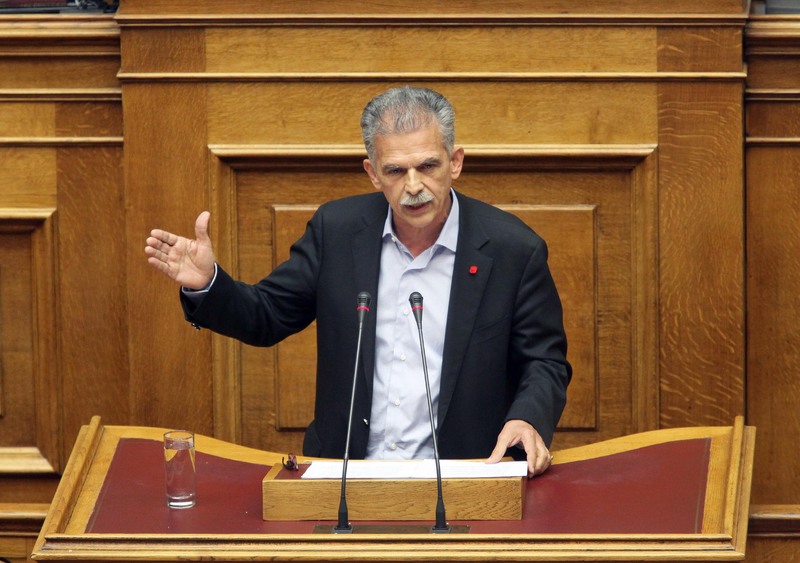 Pasok keeps a guilty “silent fish,” in relation to what he emphatically advocated in the past, namely by the ‘Helsinki detention’ of the Costas Simitis– George Papandreou period. Unfortunately, today, even his formerly prudent voices, conveniently, are hiding in the “anti-SYRIZA” burrows that his leadership dug. Thus, Pasok seems in an absolutely narrow-minded and short-term to recall his old slogan “EEC and Nato, the same syndicate”. The Macedonian name issue has divided Greek public opinion for three decades. Given the upheaval that the confrontation took over in the immediate past, do you think that after the agreement is passed, the division will continue or diminish? The tendency of Greek society into political divisions, for smaller or bigger issues, is known. The division of “patriots” on one side, and “enthusiasts” or even “traitors” on the other was easily adopted in various historical phases. In a furious way, the opposition invested on the patriotic sentiment of the citizens, who, through ignorance and misinformation, easily embedded in their anxiety. The very parties of the opposition will soon find in front of them the problems caused by their irresponsible micro-political attitude. I am afraid that it will take time and effort to prove that nothing threatens the national integrity of the country and that we are not in danger of any irredentism. Since 2010, the Greek political system has been in crisis, with the main characteristic of disrupting the traditional two-party system. Do you think that we are now in the process of exiting this crisis? For a long time, I find that the political system as a whole is in retreat. It is obvious that we have been in a process of redeployment of political forces and I am sure that after the next election, no party will be the same. This redeployment is certainly not just a Greek phenomenon, but a pan-European phenomenon. At the national level, the contrasts, the projects are not what they were four years ago. I mean when the political scene was set on the basis of contradictions that no longer exist now: “Memorandum – Anti-Memorandum”, “We Stay – We Leave Europe”. Nowadays, what we are asking for is another while we are looking desperately for a new dipole, which will inevitably lead to a new bipartisanism. But the real questions are not answered: What is, the sustainable production model that will generate national wealth and bring solid jobs? How will we deal with the ever-increasing uncertainties of citizens? How will we reduce inequalities? And of course, how will we improve the international role of the country? This is necessary if we want to survive in an increasingly competitive and uncertain international environment. Sooner or later, Greece will hold parliamentary elections. In recent statements, you have expressed your support for the convergence of progressive forces. What do you mean exactly with this? For quite some time now, I have been talking about the necessity of understanding and the convergence of progressive forces in Europe, in the face of the far right and the nationalism that are advancing. This, in my view, is a necessary process for Greece too, because it is necessary to go beyond our political provincialism and see us within the big European frame. Today, after leaving the Memoranda, the political map is reshaping, and we are looking for the real eclectic affinities on the basis of which political proposals for society will be created. The formation of a dynamic, reformist and progressive pole is essential and decisive for the country on major issues such as the Macedonian, human and citizen’s rights, the mitigation of inequalities, the care for the weaker, the re-regulation of the labour market, the necessity of public interventions to increase the social wage. SYRIZA’s positions are more akin to the positions of Social Democracy. On the other hand, I understand that the divisive rhetoric that brought SYRIZA to power created wounds. However, I appreciate that SYRIZA has long been reconciled with reality and has nothing to do with the early SYRIZA. The Social democracy, especially the domestic one, must follow the laws of motion and evolution, not the inertia and the clutching policies if wants to survive. You have been a Member of the European Parliament. How worrying is the rise of the far right and the parties based on the rhetoric of Islamophobia and the risk of immigration observed in most European countries? I am clearly worried, as Europe is now redesigned, amidst an up-and-coming nationalist far right and amidst the awakening of national egotisms. In a few words, the European idea seems to “blur”. The international reality is changing rapidly, assisted by the consolidation of unregulated globalisation, of new economic and political links and the new geopolitical data it creates. Thus, we witness the prevalence and spread of irrationality, as well as any kind of populism, especially of the right-wing one, who is the most alarming (Trump, Brexit, the election of authoritarian leaders in Eastern European countries). With this in mind, we need to realise that Europe’s real, existential problems, such as the crisis of competitiveness, the demographic and migratory refugees, part of which is Islamophobia, can be addressed only with combined European policies. In order to avoid ending up as a historic fossil, Europe must evolve and regain its momentum. This can only happen if Europe reconnects with its citizens, who ask for nothing more than “more democratic and more representative Europe”. The “democratisation” of the functioning of the Union is of paramount importance. Democratic legitimacy in decision-making, transparency and accountability is ensured by strengthening the Community model of governance, as opposed to the intergovernmental. For example, the Eurogroup or the Euro working Group can no longer operate arbitrarily and non-transparently, in the absence of elected representatives of European citizens.